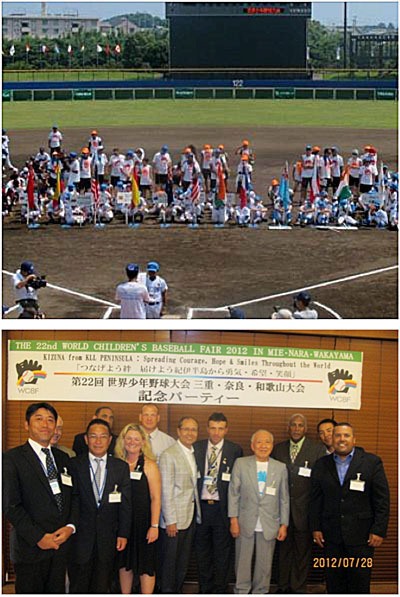 (Kumano, Mie, Japan) The World Children’s Baseball Fair (WCBF), held each summer, invites 10 & 11 year-old girls and boys from all around the world to take part in elementary baseball clinics by a dozen coaches sent from IBAF, friendship games and intercultural activities. Mr. Sadaharu Oh, the home-run king of Japan, founded WCBF together with his American counter-part, Mr. Hank Aaron and host the Fair every year either in Japan, U.S.A., Canada and Chinese Taipei. The 22nd Fair was held over 9 days from July 22 through July 29, 2012, in Mie, Nara and Wakayama Prefectures in Kii Peninsula to encourage people in the region who are still struggling to recover from damages inflicted by typhoon last September. IBAF Sub Head Coach Peter Caliendo says “This has been one of the best well organized and run programs I have been involved with.” About 150 children from 13 countries/regions learned from IBAF coaches how fun it is to play baseball and teams from Korea and China played friendly games with a few junior teams in Wakayama region. The IBAF coaches from overseas were: Angel Bonilla (Head Coach), Peter Caliendo (Sub Head Coach), Edgar Perez, Robin Wallace, Darwin Barker and George Santiago. From Japan: Yoshihisa Uchikawa, Daishin Nakamura and Kazumasa Komeda. Copyright Baseball Federation of Japan All Rights Reserved.